This morning, I awoke to a lovely autumn snowscape. My pumpkin lights were topped with snow. Cute! "My snow beret is tres jaunty, non?" "If pumpkin pie can wear whipped cream, so can I!" "This Halloween, I'm going as Marie Antoinette's head." Or perhaps simply "Happy Halloween from Colorado!" In other news, I treated myself to one more t-shirt. This one glows in the dark. I've tried several times to make a dress with a fitted bodice (usually with princess seams), and I've failed each time. With every pattern I've tried, the resulting dress gaped open at the neckline, with lots of excess fabric across the upper chest.. The fundamental issue is that my upper chest is very narrow -- a problem that the usual adjustments for a smaller or larger bust do not solve. Other adjustments are challenging because of the way princess seam dresses are constructed. On most of them, the shoulder straps are part of the bodice front. Thus I couldn't alter the bodice front to accommodate my narrow upper chest without skewing the shoulder straps and armholes. I finally found the solution in McCall's 6027. 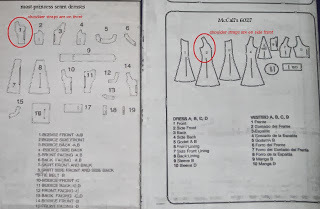 In this pattern, the shoulder straps are part of the bodice side front, leaving me free to alter the bodice front without skewing the shoulder straps. Even better, the bodice front has a seam down the center, giving me an easy reference for narrowing the bodice. After making a muslin and using myself as a human pincushion dress form to go through several iterations, I finally ended up with a bodice that fit. The trick was to alter it along the center seam, narrowing it 1.25" at the top, tapering down to .5" at the waistline. I also added 2.5" to the length to accommodate my longer torso. The photos below show a comparison of the original front pattern piece and my front pattern piece. Luckily, I did not have to change the curve of the bust seam, which meant I didn't have to alter the side front pattern piece. I was able to get the proper fit by making changes only along the center seam. 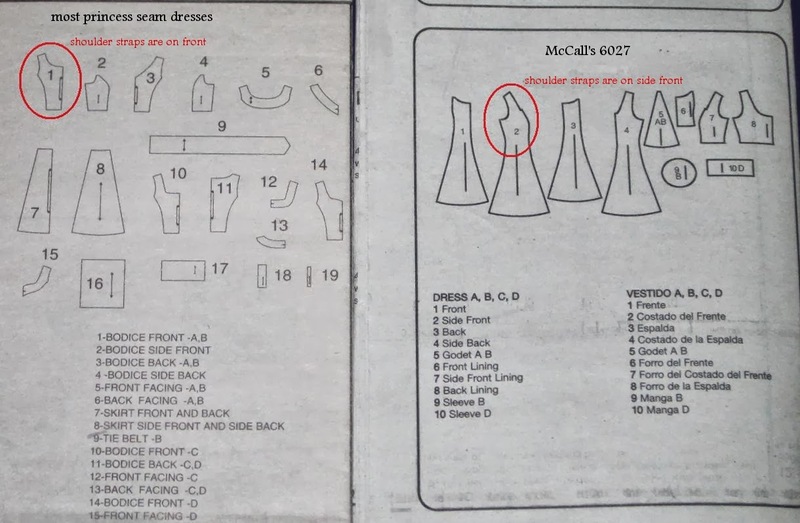 There is one big drawback to McCall's 6027 -- it's too low-cut for me. The easy solution is to wear it as a jumper (a sleeveless dress worn over a shirt). It's very comfortable, but I suspect it makes me look like a schoolteacher. This is especially true in the Halloween fabric I used for my first successful prototype. I have since made three more jumpers, with some variations, which I will show in upcoming posts.